Eden's Garden: Writing My Story: One of These Is . . .
One of These Is . . . I would like to rewrite history just a bit. I'd like to be better. Different. Happier. More peaceful. More courageous. Less self-centered. Less selfish. All of that sounds noble and good, doesn't it? I think I mean those things too. And lucky for me, they are all within my power, my realm and my scope. I can grow and change. I can be better. But when I look at this picture below? The only way I want to rewrite history is to be normal. To look normal. To NOT be different. Aaaah, yack! Saying that makes me want to hurl because of the "woe-is-me" and "my-life-is-so-hard" flavor of that statement. Yet, that is my first reaction. The hurting in my tender place is that for so much of my life I have stuck out like a sore thumb in exactly this way. I do not want to stick out. Not this way at least. It seems that size does matter, no matter the reference. That is just my first reaction. When I sit down though and look at this picture, I see more. I see pretty colors, a gorgeous backyard, the generosity of friends and family, the celebration of a grand event. And then I see these women who are comely in their refinement and their color coordination. These women are my sisters, my family--new and old, biological and not. We are missing Cassie here as she is on her mission. And another one who had passed out of our family a couple of years before. And not pictured as well are the eight beautiful nieces who are growing up so fast that they will soon be women themselves. This day we were celebrating the addition of a new sister to our midst at Rus and Marin's wedding reception this summer. It was a very happy day. A day of joy and celebration for them and the love they had found together. It was a good day. And when I look at this picture and these faces you know what I see? Beauty. Yes, beautiful in appearance but I see beauty shining from their eyes and and their souls. 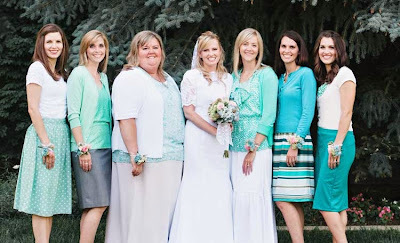 Cissy's quiet grace, Tami's refined elegance, Marin's shining joy of love, Meg's mothering radiance, Michelle's creative acumen, Julie's passion for life. I see women who are strong, committed, loving, funny, happy and hopeful. I love them. I love their goodness and their grace. I've seen their ups and downs and they have seen mine. We have comforted and grieved with one another. We have prayed, laughed and danced too. That is my second reaction. And that reaction uplifts me rather than drags me down. And when I hold to my second reaction rather than my first, my heart grows ten sizes too large for my chest. The way I really want to rewrite history is to see and be seen with this second perspective rather than the first. I am not very good at this yet. It is too easy for me to see myself as the victim rather than the victor, the less-than rather than the selfless. But I understood with honesty and faith and hope, I can learn to rewrite my very thoughts when I look back at my life. You are amazing. That is all you need to remember. I know that sounds like a "pat" reply. But you are. I am amazed by you for sure. I think it is good to concentrate on the 2nd part of your blog post. All of us should remember this. Dumb outer appearance issues that everyone has with themselves and everyone has them about themselves. I add myself in thinking of the list of improvements I wish I could make to myself. But i am also reminded just as you stated of what is really important. Thank you for the reminder. Everyone on this earth is amazing and has untold potential. I just have to say, you speak many feelings of my heart so well. Words that cut into my heart, build my soul and also remind me I'm not alone. Thank you for using your talent of writing to share and being brave enough to share such personal feelings that have helped me and I'm sure many others. I think you are amazing!!! Writing about my loves of food, health, the arts and relationships. Comments make me happy. I'd love to hear what you have to say or if you would rather send an email, send it to edennoel2 at gmail dot com. @2010 Eden Noel. Simple theme. Powered by Blogger.